I am so annoyed with myself right now, and as I am wont to do these days, I blame it on the flu. 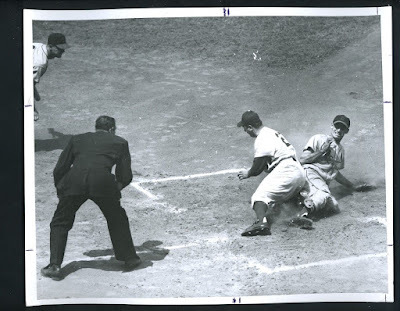 What happened is last week I ran across the above vintage 1955 press photo on eBay (link here) featuring an in-action pic of Tommy Lasorda. Knowing how rare something like this is to see (considering how short his playing career was) I focused on just that fact... But, as helpfully pointed out by Jon Weisman on twitter, it proved to be so much more interesting than that. First of all, this photo is actually from Tommy Lasorda's first and only start as a Dodger pitcher on May 5, 1955. And if you know your Lasorda history you know that this game was a disastrous beginning to his Major League playing career. At the same time, it might have been one of the more pivotal games in his career. I say this because if not for menacing slide shown above history might have gone into an entirely different direction for our future Hall of Fame manager. To start, the photograph features St. Louis Cardinals 25-year old left-fielder Wally Moon sliding hard into a sprawling Lasorda at home plate. Tommy had thrown a wild one to give up a run, and no doubt did his best to block the plate. As you may know, Lasorda's one-and-only start as a Dodgers lasted only one inning. He began the frame by walking Wally Moon on seven pitches. Then threw a wild pitch to get him to second. The next batter, Bill Virdon, would also walk. Then, with Stan Musial at the plate Tommy threw another wild pitch to send runners to second and third. Lasorda wanted to go back onto the field for the second inning, but teammates Don Newcombe and Russ Meyer dragged him to the clubhouse when manager Walter Alston signaled for Clem Labine to enter from the bullpen. Lasorda never made another start for Brooklyn. He made three relief appearances and was famously bumped from the roster in June to make room for bonus baby Sandy Koufax, who was coming off the disabled list. The Dodgers sold Lasorda’s contract to the Kansas City Athletics the following spring. It's funny how things turn out. Not only did the above slide effectively change the course of Lasorda's career, but it also eventually lead to Sandy Koufax taking his place on the Dodgers roster. This one slide ushered in the careers of two future Dodgers' Hall of Famers. You can check out a boxscore of the game here.